See Seattle’s essential sights in one fun, busy day on this 9-hour adventure that includes a city tour, time at Pike Place Market and a trip to the Boeing factory. Start with a city sightseeing tour of top attractions like the Space Needle, Pioneer Square, Lake Union and the Ballard Locks. Then enjoy 90 minutes of free time at Pike Place Market to explore and buy lunch, and end the day with a tour of Boeing’s assembly plant and Future of Flight Aviation Center. Hotel pickup and drop-off is included. After hotel pickup, your Seattle combo experience starts with a sightseeing tour of the city’s top neighborhoods and attractions. You’ll see famous landmarks like the Space Needle and drive through popular neighborhoods like Chinatown and the International District. Sit back and relax on board your spacious mini-coach while your knowledgeable guide provides all kinds of fun facts and stories about Seattle’s rich history. You’ll cover an impressive 50 miles (80 km) of territory! At some locations, you’ll stop and get off the mini-coach so you can take pictures and walk around a bit; these stops include historic Pioneer Square, the fascinating Ballard Locks (aka Hiram M Chittenden Locks) and a spot where you’ll have an amazing view of the Seattle skyline, waterfront and, if it’s a clear day, Mt Rainier. Your city tour ends at Pike Place Market, where you’ll be dropped off for free time to explore the market and have lunch at your leisure (own expense). One of the country’s oldest farmers markets, the multi-level Pike Place Market takes up 9 acres (3.5 hectares) of prime waterfront space in downtown Seattle. Watch the famous fish throwers just inside the main entrance; get lost in the winding maze of food stalls and shops; and have a bite to eat at one of the 30+ restaurants. After lunch, meet back up with your guide and board the mini-coach to head to the Boeing factory — about 25 miles (40 km) north of the city in the town of Everett — for your tour of the assembly plant and the Future of Flight Aviation Center. On the way, your guide will tell you a bit about the factory and can answer any questions you have. 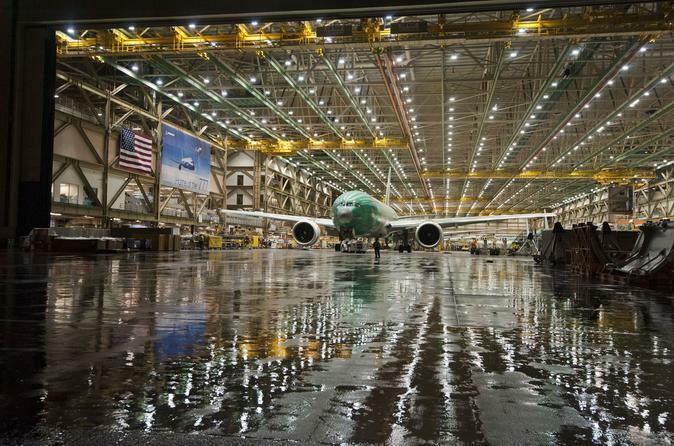 When you arrive, a Boeing guide will take you on a behind-the-scenes tour of the plant, where you’ll see where Boeing airplanes — including the 747, 767 and 787 Dreamliner — are all manufactured in the largest building in the world. As you look down on the factory floor, you can witness the assembly of the jets, and then head down to the flight line to see the planes being painted with logos from all of the airlines around the globe that purchase Boeing aircraft. You may also see a Dreamlifter — a 747 cargo plane designed to carry the Dreamliner’s large parts to Everett for assembly. You’ll also visit the Boeing theater to watch a time-lapse film of the complete production of a 777 plane, and then follow your guide to the Future of Flight Aviation Center to round out your total Boeing experience. Interactive exhibits allow you to design and test your own aircraft and fly your own plane in the exciting flight simulator.